The tectonic evolution of the basin is the important content of the analysis of sedimentary basins. Tectonic evolution and its characteristic determine the shape and scope of the basin, and determine the various elements of petroleum geology. Tectonic evolution along with the long-term tectonic movement, produces a series of faults, fractures and various tectonic phenomena, controls and affects the basin hydrocarbon source rock, reservoir and seal development, restricts hydrocarbon evolution and hydrocarbon migration process and storage conditions, so as to control the formation and distribution of oil and gas reservoirs.
. ZHANG Yonghui, XIA Bin, Controls on the Hydrocarbon Accumulations in the Chexi Sag [J]. Geotectonica ET Metallogenia, 2010.11, 593-598.
. Pang Xiongqi, ZHOU Xinyuan, Hydrocarbon Reservoirs Formation, Evolution, Prediction and Evaluation in the Superimpose Basins [J]. Acta geological sinica, 2012.1, 1-10.
. YUAN Qing-dong, LI Ben-liang, he tectonics evolution and lithofacies palaeogeography in the northwest of the Sichuan Basin [J].Journal Of Daqing Petroleum Institute, 2010, 34(6):42- 52.
. Li D. The principal characteristics of the lithosphere of China [J].Geoscience Frontier, 2010, 1(1): 45-56.
. Wang D Z, Shu L S, Faure M, et al. Mesozoic Magmatism andGranitic Dome in the Wugongshan Massif, Jiangxi Province and Their Genetical Relationship to the Tectonic Events in Southeast China [J]. Tectonophysics2001, 339, 259-277. This paper research on geothermal field characteristics in different depths and the deposition conditions of different formation units, clarify the geothermal reservoir characteristics of the study area, analysis the hydrogeology characteristics of the groundwater, evaluate the geothermal resources. Based on the calculation results of geothermal resources, in order to be more intuitive determine the distribution of geothermal resources, opt the target area, calculate the geothermal resources abundance, that geothermal resources in the plane of the distribution, for every square kilometer of area contained heat. The results of geothermal resources abundance distributions Tailai County range 0~28.3×1012KJ/km2, distribution trends in the plane of its performance for the eastern high, westward gradually smaller.
. Lund J W. Direct utilization of geothermal energy. Energies, 2010, 3(8): 1443~1471.
. Tissot B P, Pelet R,Ungerer P H. Thermal history of sedimentary basins,maturation indices,and kinetics of oil and gas generation. AAPG bulletin, 1987, 71（12）：1445~1466.
. Shu Liangshu, Mu Yufu, Wang Bochang. The Oil-Gas-Bearing Strate and the structural geatures in the Songliao Basin, NE China. Journal of Stratigraphy.2003 (4): 340~347. An ideal solar selective surface coating must have good optical properties like high solar absorptance and minimum solar emittance. A new and affordable solar selective surface coating having higher solar absorption efficiency with low in-frared emittance compared to the commercial black paint coating used in most ordinary solar water heating systems has been developed. Such as solar selective coatings like black Nickel-Aluminium alloy particles with commercial black paint. Also, soalar selective surface coating with black nickel-cobalt plating on aluminium alloy substrates with nickel undercoat has been developed. Characterization study of such solar selective coatings is done in this paper. Characterization of coating includes Spectroscopic studies, Surface morphology and XRD studies, Polarization studies for corrosion resistance. Keywords: Nickel-Cobalt coating, solar selective coating. Metallic Nickel-Aluminium alloy particles, solar absorptance, and solar emittance.
. Solar Energy Materials Solar& cells 91(2007), 629-635 Solar selective black nickel-cobalt coatings on aluminium alloys,A.R.Shashikala,A.K.Sharma,D.R.Bhandari,thermal system group,ISRO Satellite Centre,Banglore,India.
. J.K. Dennis, T.E. Such, Nickel and Chromium Plating, third ed., Woodhead Publishing Ltd., Cambridge, UK, 2003 p 240.
. S. Jhon, Metal Finish. 95 (6) (1997) 84.
. N. Karuppiah, S. John, Bull. Electrochem. 16 (2) (2000) 71. The most commonly used methods for structural steel design in India are working stress method which is based on IS 800: 1984 and Limit state method which is based on IS 800: 2007.In Indian context most of the steel structures were designed on the basis of working stress method but now a days the latest standards introduced by IS 800: 2007are in use. Thus the approach has been made to make the comparative study of both codes and to evaluate the economy achieved using IS 800: 2007. An illustrative study has been carried out on tension member subject to axial load. Total 47 members have been analyised. Thus from the results obtained it is observed that working stress method of analysis underestimates the actual strength of members. Also it is observed that the strength of member largely depends upon its length of outstand, pitch and gauge distances. KEYWORDS: Tension members, IS 800: 2007, IS 800: 1984, design strength, Rupture strength. Mohan Gupta and L. M. Gupta, 2004, Evaluation of stress distribution in bolted steel angles under tension, Electronic Journal of Structural Engineering, 2(4). IS 800: 1984, Code of practice for general construction in steel, Bureau of Indian Standards, New Delhi. IS 800: 2007, Code of practice for general construction in steel, Bureau of Indian Standards, New Delhi. Fathy A. Abdelfattah and Mohamed S. Soliman, Shear lag in bolted tension members at elastic and yielding loading conditions, Alexandria Engineering Journal, Vol. 42 (2003), No.4, 463-474. C. S. Nair, Dr. S. Sreekumar, Investigation on the Bahaviour of Rolled Steel Tension Members, Department of Civil Engineering, College of Enginering, Trivendrum, Volume 90, pp 32-37, August 2009. The main target of this work is to evaluate the performance of a host/co-processor architecture including an embedded Nios-II processor and utilizing a communication channel between host and hardware board, like a USB2.0 channel. The task-logic performed by the embedded accelerator can be any image function within the limitations of existing FPGA devices. For our purpose we built a typical image-processing application in order to target the FPGA co-processor. It consists of a noise filter followed by an edge-detector. Noise reduction and edge detection are two elementary processes required for most machine vision applications, like object recognition, medical imaging, lane detection in next-generation automotive technology, people tracking, control systems, etc.
. Yang Zhao,Yanguang Cai and Guobing Fan, Dynamical Behavior for Fractional-order Shunting Inhibitory Cellular Neural Networks,Journal of Nonlinear Science and Applications, 9(6), 2016, 4589-4599.
. Yang Zhao,Research on Active Control of the Dynamic Vibration for Underwater Robot,Journal of the Balkan Tribological Association,22(1A),2016,pp770-779.
. Yang Zhao,Yanguang Cai and Xiaojun Yang,A Local Fractional Derivative with Applications to Fractal Relaxation and Diffusion Phenomena,Thermal Science,20(S3),2016,pp723-727.
. Liya Wang,Yang Zhao,Yaoming Zhouand Jingbin Hao,Calculation of flexible printed circuit boards (FPC) global and local defect detection based on computer vision,Circuit World,42(2), 2016, pp. 49-54.
. Yandong Zhang and Yang Zhao,Design & implementation of an Air Quality Monitoring System for Indoor Environment based on Microcontroller,International Journal of Smart Home,9(11), 2015, pp. 301-312. Genetic Algorithm is one of the best optimization techniques to design Digital Differentiator. It is found in many applications, from low frequency biomedical equipment to high frequency radars. DDs are useful in new developing fields such as touch screen tablets and online signature verification. In this paper we have designed forth order digital differentiator of filter length thirty two by using Genetic algorithm.Many methods have been developed to design all types of differentiators but there is still scope of improvement to design DDs with minimum error. This paper examines SNR characteristics of a hazardless alternative for data transfer using Visible Light communications (VLC) for radio frequencies (RF) restricted indoors areas such as aircrafts and health care systems. This communication system will be used for patients' health monitoring in addition to providing the users with high data rate for multimedia contents applications. Since RF can be hazardous for patient's health and could potentially damage the expensive instruments of the hospital, Visible light emerges victorious in communication battle. Room illumination and lux distribution simulations are created using Dialux evo and optical power distribution and power calculations are simulated in MATLAB. Further, the effects of three major factors in the wireless optical communication including Distance, Modulation and Data Rate are analyzed based on the SNR and BER of the communication channel.
. E. Chan, "Wireless Optical Links for Airplane Applications," Photonics Society Summer Topical Meeting Series, 2012 IEEE, pp. 76-77, 11 Jul 2012.
. D. Giustiniano, N. O. Tippenhauer and s. Mangold, "Low-complexity Visible Light Networking with LED-to-LED communication," Wireless Days (WD), 2012 IFIP, pp. 1-8, 23 Nov 2012.
. P. Kuppusamy, S. Muthuraj and S. Gopinath, "Survey and challenges of Li-Fi with comparison of Wi-Fi," 2016 International Conference on Wireless Communications, Signal Processing and Networking (WiSPNET), pp. 896-899, 2016.
. M. Kavehrad, "Broadband Room Service by Light," Scientific American, pp. 82-88, 2007.
. A. Devi and P. Shanthi, "Design and implementation of a Radio on visible light system for indoor communication," Communications and Signal Processing (ICCSP), 2014 International Conference on, pp. 132-136, 2014. The authors have developed a cloud real-time single-elimination tournament chart system. The user can easily create a tournament online. Each team can easily sign up in the system. The tournament scheduling can draw online and draw real-time match score. According to the time setting, the system establishes a timetable figure. The users can download this timetable to a client computer and use Microsoft Excel to modify the table number, date and time cells. After the modification has been updated, the users can upload the timetable to the cloud system. Finally, this system enables everyone to watch the tournament charts online. After the match finishes, the computer operator inputs the score of each match. The cloud system will compute the tournament charts and progress to the next event match. This system is a complete cloud real-time single-elimination tournament chart system. Hassan, & Qusay. (2011). Demystifying Cloud Computing. The Journal of Defense Software Engineering, 16-21. Jacobson, S. H., Nikolaev, A. G., King, D. M., & Lee, A. J. (2011). Seed distributions for the NCAA men's basketball tournament. Omega, 39(6), 719-724. Khatibi, A., King, D. M., & Jacobson, S. H. (2015). Modeling the winning seed distribution of the NCAA Division I men׳s basketball tournament. Omega, 50(0), 141-148. The International Table Tennis Federation Handbook on Table Tennis. (2015). In the current study, a chemically modified collagen bilayer dressing with ciprofloxacin was prepared from type-I collagen. The modified collagen was reconstituted into a membrane and sponge and the drug Ciprofloxacin-HCl was incorporated and fabricated into a bilayer dressing. In vitro release pattern of the dressing was analysed in PBS which recorded release for 6 days. The efficacy of the dressing was checked on infected wound in rat model and compared with that of open infected wound and control group. The healing pattern was analyzed on days 3, 5, 7, 14 and 21 by wound healing rate, biochemical and histological examinations of granulation tissue samples. Integrin expression on the healing wound was analysed using immunohistochemistry and western blotting analysis. In vivo analysis showed significant wound closure, biochemical analysis such as protein, DNA, hydroxyproline, uronic acid, hexoseamine, SOD and catalase from the granulation tissue, showed enhanced healing in the group treated with collagen bilayer dressing with ciprofloxacin. Integrin expression was more in initial stages of healing than the other two groups confirming enhanced healing in treatment group. Histological analysis and wound closure further confirmed proper healing in this group. Our results suggest that sustained bilayer dressing with drug is efficient in controlling and eliminating the bacterial population at the wound site thereby enhancing the healing. C.H. Heldin and B. Westermarck, Role of platelet-derived growth factor in vivo, in: R. Clark (Ed. ), The Molecular and Cellular Biology of Wound Repai, (New York: Plenum Press, 1996). J. Reibman, S. Meixler, T.C. Lee, et al. Transforming growth factor beta 1, a potent chemoattractant for human neutrophils, bypasses classic signal-transduction pathways. Proc Natl Acad Sci U S A, 881991, 6805. The main objective of this project is to develop a biosensor based on freezing elements receptors on a Nano wire containing electrode to detect Nano-virus. Viruses are very small micro-organisms that could lead to damage and disease between simple to very serious disease and be the cause affecting the health of humans, animals and even plants. This may include, for example flu or cold that affects life and more life-threatening humans, for example, HIV / AIDS. The virus particles are a hundred times smaller than a single cell of bacteria. A bacterial cell alone is much smaller at about ten times that of a human cell that is ten times smaller than the diameter of a human hair. It is gravity that viruses may also infect bacterial cells and controls the immune organs by knowing the private life of the bacterial cell and then grow and multiply and then infected cell produces viral particles rather than perform its normal function. Thus, the viruses are among the most important causes of serious diseases that infect humans and there is a growing interest detects viruses and selective disclosure of sensitive sensors work for viruses. This is essential for the implementation of an effective response to a viral infection, such as medication or through quarantine. There are some ways set up to analyze the viral assays include immune assays panel.
. A.K. Wanekaya, W. Chen, N.V. Myung, A. Mulchandani. Electroanalysis, 18:2006,533–550. The present work was undertaken the study on the health problems faced by flour mill workers in Kolhapur city with the aim of workplace environment affect on the health of flour mill workers. During study the unhygienic conditions were observed in the workplace environment of flour mills as fine organic flour dust gets airborne in the indoor environment of the flour mills that may cause serious health problems to the flour mill workers. Data has been collected by a structured interviewer and administered questionnaire. The questionnaire contains questions on respondents demographic attributes, reported respiratory symptoms, smoking status of the subjects and occupational history in relation to exposure. The work histories of the study subjects has been assessed through questions on current job, daily working time, job description, working conditions, and protective measures used etc. Collected data were analyzed with the help of Microsoft Excel. Keywords: Flour Dust, Flour mill workers, Health, Unhygienic, Workplace Environment. Sudha Babel and Rupali Rajvanshi. Occupational health hazards faced by the spice grinding workers. Asian Journal of Home Science. 8(2), 2013, 518-521. N. A. H. Ajeel, and A. K. Al-Yassen. Work related allergic disorders among flour mill Workers. The Medical Journal of Basrah University (MJBU). 25(1). 2007, 29-32. E. A. Karpinski, Exposure to inhalable flour dust in Canadian flour mills. Appl Occup.Environ.Hyg;. 18, 2003, 1022-33. H. Kakooei and H. Marioryad.Exposure to Inhalable Flour Dust and Respiratory Symptoms of Workers in a Flour Mill in Iran. Iranian Journal of Environmental Health Science & Engineering. 2 (1), 2005, 50-55. The three main type reactor developed for batch, continuous stirred reactor and plug-flow reactors are useful for modeling many complex chemical reactors. In this work, step response,impulse and ramp is studied theoretician in a a continuous tank reactor.The aim of this study is to investigated the mathematical analysis on functions response in a continuous stirred tank rector. the parameters assumed for analysis are the flow rate is constant for the whole system f=0.085m3/min, the volume the tree tanks is the equal v1=v2=v3=1.05m3, and reaction rate k=0.041/min. All tree transfer function showed favorable results. Keywords: Step Response, Ramp, Impulse Response, CSTR.
. Adebekun. (1996). Output feedback control of a stirred tank reactor, Computers and Chemical Engineering, 20 (8), 1017–1021.
. Danish and et al, (2015). Effect of Operating Conditions on CSTR performance: an Experimental Study. Journal of Engineering Research and Applications. 5 (2)74-78.
. Saad and et al. (2013), Modeling and Control Design of Continuous Stirred Tank Reactor System.Proceedings of the 15th International Conference on Automatic Control, Modelling & Simulation (ACMOS '13). For the last few decades, web applications and web based tools provide an automated way for supporting many useful services. Among them, web based compilers and output generators provides user many important functionalities like zero install, saving time, online storage ,etc. The prime objective was to provide as good services as the desktop application. But the existing applications lack in a few things like very few database support, project/file management, backup, etc. We have developed backbone IDE, a web based compilation and output generator to overcome these drawbacks and provide an efficient run time environment for the users. Also this IDE provides multiple database support for the scripts written by the user along with the portal for learning purpose which includes documents in the form of portable document format (PDF), power point presentation (PPT) and videos. The application mainly provides user, the capability to execute their scripts without having the overhead of installing or configuring any of the required platforms. Girish Chae, Gautam Das, Kaustubh Dasgupta, Arun Kumar, Sumeet Mittal, Soughte Mukherjlea, Biplav Srivastava "An Integrated development or Web Service Composition", IBM India Research Laboratory, 4, Block -c, Institutional Area , Vasant Kunj, New Delhi, India. Hongwwi Li, Xuegiao Zhao, zhenchang Xing, Lingfeng Bao, Xin peng, Dongjing Gao, "amAssist : In-IDE Ambient Search of Online Programming Resorces", Wenyon Zhao school of computer science,Funden universityShanghaia ,China. Thomas Ball, Sebastian Burckhardt, Jonathan de Halleux, Micha Moskal, Jonathan Protzenko, nikolai Tillmann "Beyond Open Source: The TouchDevelop cloud-based Integrated Development Environment ", Microsoft Research One Microsoft Way, Remond WA 98052, USA. Hai T.Tran, HaiH Dang, Kha N.Do, Thu D.Tran, Vu Nguyen, "An IntractiveWeb- Based IDE Towards Teaching and Learning in Programming Courses", University of Science VNU-HCM, Ho Chi Minch City, Vietnam. Vu Nguyen, Hai H Dang, Kha N.Do, Thu D.Tran, "Learning and Practicing Object Oriented Programming Using a CollaborativeWeb-based IDE" , Faculty of Information Technology, University of Science, Vietnam National University - Ho Chi Minch City. Fingerprint recognition is one of the method to identify between two or more persons. This method is commonly applicable in many industries, The technology provide higher security than traditional methods such as signature, pins, smart cards etc. With the help of features which are extracted from human fingerprints the input image is analyzed and compared with database to find authorized person. Oriented images are also recognized with the help of different algorithms such as DWT with Gabor filter, haar wavelet transform. By using these algorithms here we recognized different oriented images such as 0°,45°,90°,etc. 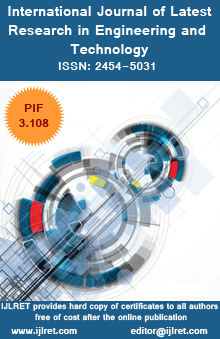 Alessandra A. Paulino &Anil K. Jain ,"Latent Fingerprint Matching Using Descriptor-Based Hough Transform " IEEE transactions on information forensics and security, vol. 8, no. 1, january 2013. Ju Cheng Yang and Dong Sun Park "Fingerprint Verification Based on Invariant Moment Features and Nonlinear BPNN " International Journal of Control, Automation, and Systems, vol. 6,no. 6, pp. 800-808, December 2008. Jossy P. George, Abhilashs. K. ,Chethana M. D. and Raja K. B. "Performance Analysis of Fingerprint Identification Using Different Levels of DTCWT " 2012 International Conference on Information and Computer Applications (ICICA 2012) IPCSIT vol. 24 (2012) © (2012) IACSIT Press, Singapore.